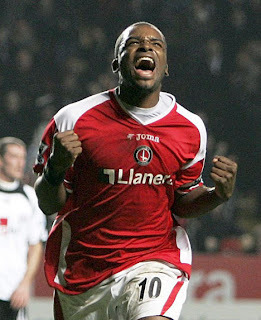 Darren Bent finally signed for Tottenham early this morning after protracted negotiations between the two clubs on fee. The deal could total £16.5m, the club receiving an initial £15.5m, with the additional £1m dependent on a number of contingencies, thought to be international caps, club appearances and Spurs' ability to qualify for the champions league. Ipswich will receive a nice little earner of £2.58m, just enough for them to sign Francis Jeffers and pay for his drinking habit. My lasting memory of Darren as an Addick is not necessarily his 37 goals in 79 games, nor his boundless enthusiasm or his bottomless running after lost causes but the way he has handled himself throughout this whole transfer process. The bloke is a class act and I for one was proud to have seen him play for our club. Good luck Benty.